JOWAI: A major disaster was averted on Saturday when in a first for the State, a high-intensity improvised explosive device (IED) explosive was found and defused at a fish selling stall in Jowai in Jaintia Hills district. The explosive arrived here in Jowai along with boxes of fishes from Barpeta, Assam at around 7 am on Saturday. The explosive was hidden in a black box kept inside the box containing fishes. The box was first noticed by two policemen who had gone to a shop to buy fishes. The shop is located near the Police canteen in MTC Stand and Police quarter. Every morning police personnel rushed to the shop to buy fishes and vegetable. According to the shop owners, Linda Suchiang and her husband, Sakol Uddin, the fishes had arrived in the morning from SKN Barpeta in two white thermocol boxes which also had an additional black coloured box marked MD which is the code used by the shop owners. The two police personnel, who had come to buy fishes, asked the shop owner to open one of the white boxes when they found a black school bag inside the fish box. When they tried to open the bag they found a black wooden box fitted with a timer clock. The timer clock was a voltmeter used in stabilizers. The two policemen then immediately alerted the officer on duty at Jowai PS who later informed the SP and other senior officers. Superintendent of Police, O Pasi, Deputy Superintendent of Police, P Syiem, Circle Inspector EB Kyndiah and other police officer immediately rushed to the spot and conducted a preliminary examination of the black box. On closer examination, the box was found to be fitted with a voltmeter similar to a timer clock, red and white wires and a LPG cylinder pipe containing many wires fitted with a headphone jack. Since the black box was attached with a volt meter or a timer clock, the police strongly suspected it to be a timer device used in bombs. As the news spread all over the town hundreds of people gathered in the area throwing caution to the wind. Some even attempted to take pictures of the IED device with their mobile phones. Police had to cordon off the area till the arrival of the bomb disposal squad from Shillong. Incidentally, the anti bomb squad could reach the spot only at 1 O’clock due to a severe traffic jam on the Shillong-Jowai highway. The bomb squad took about an hour to remove the black box to a safer location away from the surging crowd at Iawmusiang. The black box was loaded in the bomb trailer and was removed to a deserted jungle in Riat-Turiem for proper analysis. 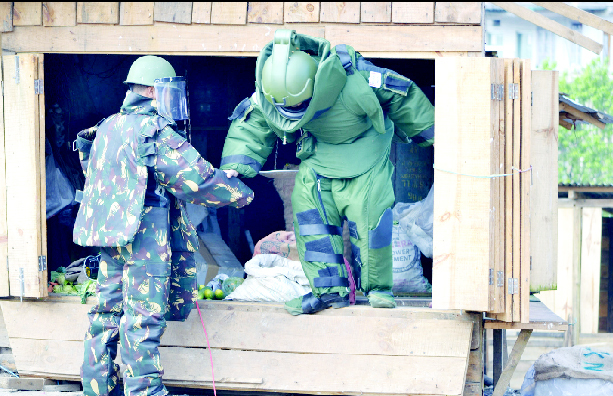 The computerized scanning, however, could not exactly confirm presence of explosives, following which the box was manually opened by B Mishra, a member of the anti bomb squad. The box was found to contain three detonators fixed within three gelatin sticks and was filled with splinters including pieces of metals, huge numbers of marbles and nails along with explosive powder. The bomb was finally defused at around 3:30 pm. B Mishra and R Kharkongor, another member of the bomb squad, later informed that the bomb was an IED and could be activated either with the help of a mobile phone or a speaker. “Such devices are generally connected to a mobile phone with a cable connected with a jack plug and the jack plug is then connected to the headphone or the earphone jack. When any one makes a call to the mobile phone, the phone will ring or vibrate triggering the explosion,” they explained, adding that this was the first time such a bomb had been detected and defused in Meghalaya. “Such bombs can cause damages to life and property at least in an area of about 150 metres radius,” they added. Another source informed that these kinds of explosive devices were used in blasts in Assam by some of the militant outfits in the past. Speaking to media persons, Jaintia hills SP, O Pasi informed that they have been receiving specific information from sources since August about ‘something’ but those could not be confirmed. “Yesterday, we again received information but we could not confirm the same. We suspected that either drugs or arms must be arriving but we never expected it to be a bomb,” Pasi said.